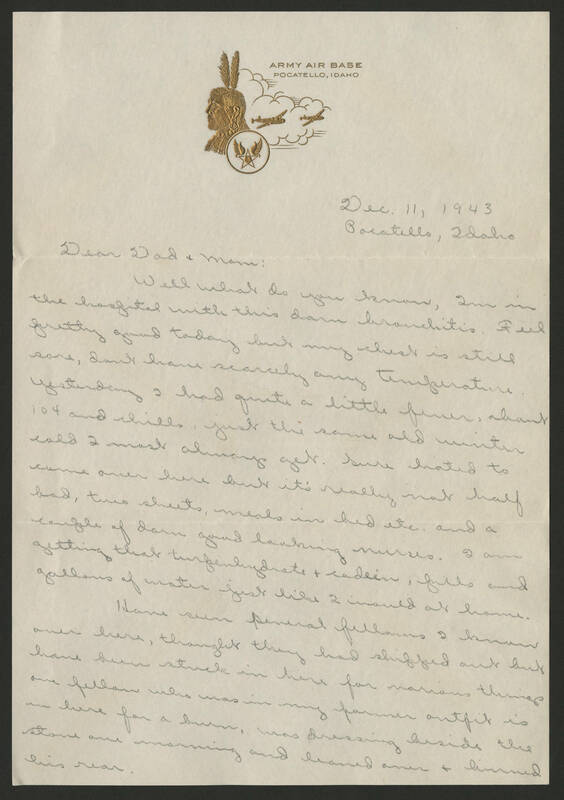 Dec. 11, 1943 Pocatello, Idaho Dear Dad & Mom: Well what do you know, I'm in the hospital with this darn bronchitis. Feel pretty good today but my chest is still sore, don't have scarcely any temperature. Yesterday I had quite a little fever, about 104 and chills, just the same old winter cold I most always get. Sure hated to come over here but it's really not half bad, two sheets, meals in bed etc. and a couple of darn good looking nurses. I am getting that turpenhydrate & codein, pills and gallons of water just like I would at home. Have seen several fellows I know over here, thought they had shipped out but have been stuck in here for various things one fellow who was in my former outfit is in here for a burn, was dressing beside the stove one morning and leaned over & burned his rear.